SnoreMate has been on the market longer than many other anti snoring devices and it has a budget-friendly price, so you might be feeling a lot like you hit the jackpot, if you just stumbled upon this product. However, even a super low price is not worth paying, if the product does not live up to its claims. If it is uncomfortable or ineffective it becomes just another “thing” in your junk drawer. So, does SnoreMate live up to its claim of being 85% effective? 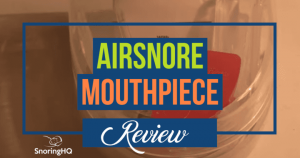 Well, I put this snoring mouthpiece to the test, so you will want to read this review to learn about the pros and cons before settling on this option. 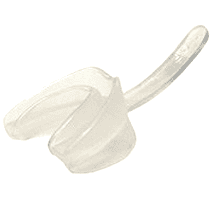 Like all anti-snoring mouthpieces, SnoreMate has its share of pros and cons. It is important to consider both sides of this list when making your decision. Low price can fit into nearly any budget. Backed by a 30-day money-back guarantee. Thermoplastic material is soft against the gums and inner lips. Device can be easily fitted at home using the boil-and-bite technique. 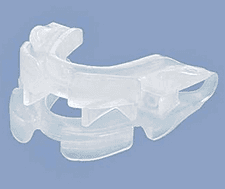 Can be worn by people with bruxism, but this does wear them out faster. One piece design makes it easy to clean. No breathing hole is present, so it can’t be worn by individuals who need to breathe through their mouth. Bulky design makes it uncomfortable to wear and may cause significant soreness. Material is not listed as BPA- or latex-free. Not cleared by the United States Food and Drug Administration. Company is not accredited by the Better Business Bureau. Short life expectancy of only three to four months, so it will need replacing frequently. Device can’t be worn with dentures, crowns, caps, or braces. May cause excessive drooling and soreness. SnoreMate has been on the market for a long time, so you have the benefit of other user reviews as well. It is an established product that many people have reported having great success with, though personally I don't think it compared well to many other options on the market. Overall I thought the mouthpiece was not comfortable and do not put it amongst my top recommendations. SnoreMate is a one-part mandibular advancement device (MAD) that is designed to hold your jaw forward, thereby keeping the air passage free of obstruction. If you are a snorer, you may be interested to know that the sound created is the result of loose tissues vibrating. As you fall asleep, all the muscles in your body relax. This includes those in your tongue, jaw, and throat. As they relax, the tongue collapses back into the throat so tissues become closer. As air is passing through it causes the tissues to vibrate. If you can eliminate the vibration, you also stop the snoring sound. 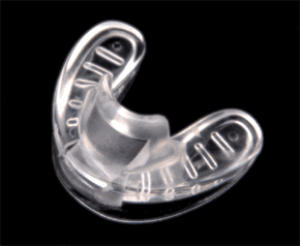 This mouthpiece is made of thermoplastic material. Unfortunately, there is no mention of the device being BPA- or latex-free on the website. So, if you are allergic to latex or concerned about your health and the environment, this would not be the right option for you. This MAD can be custom-fitted in the privacy of your own home using a boil-and-bite method. This is a simple process that shapes the device to the outline of your mouth. SnoreMate does not allow for adjustments, so you can’t change the position of the lower jaw. SnoreMate does not have a breathing hole. So, if you have sinus issues, nasal polyps, chronic allergies, or a deviated septum, you will need to choose a different product that has an airflow hole to allow for mouth breathing. Like other MADs, this one is not suitable to wear with dentures, crowns, loose teeth, or braces. It can be worn by individuals who grind their teeth, but understand that it will wear out faster. The lifespan is already only three to four months, which is considerably shorter than many anti-snoring devices on the market. SnoreMate is one of the least expensive MADs on the market. A single device is $32.00, and it comes with a storage case. If you buy the Twin Pack the price is $42.00, thereby reducing the price per unit substantially. Shipping is $8 for either option. Keep in mind that although the per unit price is low, it needs to be replaced every few months (more frequently for those with bruxism), so the cost of replacements will add up. If price is playing a large role in your decision, it would end up being less expensive to go with a higher priced device with an average lifespan of 12 months, so you really get your money’s worth out of it. SnoreMate is backed by a 30-day money-back guarantee. Boy, my credit card was happy about only paying $42 for two devices. Unfortunately, as I have found in the past, the mouthpieces that I have been this excited about trying disappointed me the most. I wasn’t expecting this device to be as streamlined or as comfortable as other products, but I also was not expecting it to feel like I was back in high school again, popping a huge mouth guard in right before a wrestling match. When it arrived, knew I still had to do the boil-and-bite method on it, but how much difference could that possibly make? When my wife arrived home, I gave her the mouthpiece, and all she said was, “You can’t be serious!” Even after we did the custom fitting process, my mouth felt so full. My wife still could not get her device comfortably in her mouth. She made it clear I would be on my own for this trial. As soon as I put it in my mouth the first night I was drooling excessively. It is common to drool a bit when I try a new mouthpiece, but this was ridiculous. The device was just so large, I could not comfortably swallow. I was about two minutes away from getting up for a towel to put on my pile of drool, but I fell asleep. Halfway through the night, I woke up to get some water, and just left it out. My temporomandibular joint (TMJ) was so sore already. I knew that the bulkiness would make it uncomfortable, but I didn’t think it would be unwearable. The second night, I drooled the same amount and it pained me to open my mouth wide enough to even insert the SnoreMate device. This time around I was smart and put an absorbent towel on my pillow to catch the drool. Night after night, I went through the same routine. Usually, the soreness and drooling decrease by the fourth day for me, but with this one the inconvenience and discomfort was getting worse. I decided to end my trial two days early because I just could not think about using it even one more night. My TMJ was so sore that it hurt to even chew food. Considering I have tried some devices that barely made me sore for even a day this one was just not worth using to me. The low price was definitely not a good value, in my experience. The worst thing about this trial is that it did not even stop my snoring the entire time. It decreased it, but did not eliminate. Is This the Right Device for You? SnoreMate has been on the market since 1999. It is a really established product that many people have reported having great success with. I can’t help but wonder if those people praising it have ever tried a more comfortable mouthpiece for comparison. Maybe, since I had previously been spoiled by a few good ones, my expectations were a little higher. Then again, maybe this device is just really poorly designed. If price is a factor, read my Zquiet mouthpiece reviews or Zyppah reviews. You only have to pay shipping upfront and then you are charged for the mouthpiece 35 days later, unless you return it in the meantime. It is more expensive, but it also lasts significantly longer, so it won’t need replacing as soon. Most importantly, it very comfortable. If you are interested in trying a product that is completely different than SnoreMate, check out Good Morning Snore Solution, a tongue stabilizing device (TSD) that I highly recommend.